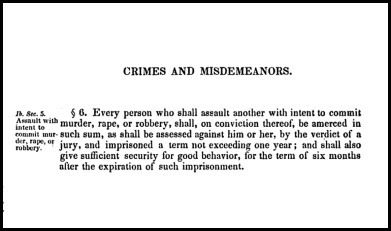 It may come as a bit of a surprise that our ancestors couldn’t be convicted of the crime of assault in early Alabama. Assault, by definition, is an “unlawful attempt or offer, on the part of one man, with force or violence, to inflict a bodily hurt upon another.”1 And in the early laws of Alabama, at least through 1833, there was no provision in the criminal code making a plain garden-variety assault a crime. Oh, there were provisions that addressed violence, of course, as The Legal Genealogist discovered in poking through old Alabama statutes for this weekend’s seminar of the Tennessee Valley Genealogical Society in Huntsville, Alabama. We all know what it’s like to be amerced, don’t we? So… what exactly was being done here? So to be amerced was to be fined, only not in a set amount but rather in whatever amount the jury in the case determined was appropriate. A kind of criminal damage award to go along with the jail term, without any fixed minimum or maximum. OMG! I’m in the Huntsville metro area. If I had known about the seminar, I would have attended. Just checked online and the last day to register was 3/25. Oh well, that’s what I get for not being a member of the TVGS. Hope you have a very successful seminar and a great stay in Huntsville. Thanks much!! And yeah, it really does pay to be a member of the local society!!! Great article! It reminds me about my own grandmother. She and two of her sisters were arrested for “assault with intent to murder” back in 1931. Grandma and her sisters Edna and Dixie attacked another woman named Nettie in a drug store. Shortly after the assault, my great-grandmother and the mother of Nettie were also arrested for verbal threats against each other. I never heard about the story until I randomly found it in a newspaper article while doing research about 10 years ago. I called my father and read him the article over the phone. He had never heard it nor had any of his siblings. I was hoping to get him to ask her about it but he left that task to me. So I called Grandma and at some point in the conversation I said: “I was going through some old newspapers…” She stopped me: “I bet you found where us gals whipped that woman!” “Yes Grandma, what happened! ?” Grandma did not hesitate: “She had it coming!” After over 70 years she had not an ounce of remorse. Grandma, Aunt Edna and Aunt Dixie and my great-grandmother only spent a few hours in jail and the charges were later dropped after they all cooled off.